It is difficult to make any judgements without data on problems and improvements. No technical data have been provided showing the current conditions, e.g. traffic flows, mode share or diurnal patterns. Likewise, no modelling of the effects of the measures proposed has been published. The basis on which the proposals have been developed is unclear, particularly in relation to population, employment and transport projections and their consistency with those data underpinning transport planning and management more generally in the city. The projected ‘improvements’ are unquantified. Since in many cases the proposals involve compromising some desirable features, such as tree retention, grass verges and vegetation, it is unfortunate that there is neither discussion nor quantification which might enable judgements to be made on the merits, on balance, of any of the measures proposed. Since vegetation loss is a potential dis-benefit of many elements of the proposals, it is unsatisfactory to simply propose that trees will be replaced where possible; removal and replacement of trees must be assessed in detail and quantified to enable considered judgements to be made on the net benefit of every element of the proposals. c) why the particular proposals put forward are deemed to be the most cost-effective/least damaging relative to other possibilities. d) It seems particularly anomalous, in the light of the recent Oxford Transport Strategy (part of LTP4) that no reference is made to the strategic objective of improving bus accessibility to and within the city’s Eastern Arc, including the introduction of new BRT services. What the collective effect of the proposed measures will be in terms of delivering this strategic objective should be highlighted. The provision of continuity to the cycle route from North Oxford to Marston, the John Radcliffe Hospital, Headington, and the Nuffield, Churchill and Warneford Hospitals is long overdue since the absence of any such continuous route has, for decades, made cycling, particularly on Headley Way, singularly unattractive and intimidating, thus negating the benefits of the excellent dedicated off-road cycle track along Marston Ferry Road. The provision of mandatory cycle lanes in both directions, linking with the cycle route along Marston Ferry Road is welcome. However, it is disappointing that no alteration is proposed to facilitate and/or prioritise the connection of the excellent off-road Marston Ferry cycle path to the proposed mandatory on-road cycle lanes on Cherwell Drive. Very little work would be necessary to remove the convolutions and discontinuity in the Summertown – Headington cycle route at this point and the necessity for cyclists to negotiate separate but very closely-spaced junctions on both Oxford Road and Cherwell Drive, so we would wish to see the proposals extended westwards to include appropriate improvements at this point. The provision of continuous 1.5m mandatory cycle lanes (including across side road junctions) is welcome. However, the provision of a dedicated eastbound bus lane leading up to the junction with Marsh Lane is more questionable; this will necessitate removal of extensive areas of grass verge and trees, and without modelling data which might quantify the benefit to bus journeys, e.g. reduced journey times, it is impossible to assess the merits of this provision, against the environmental harm resulting from the loss of trees and verge. The requirement for a bus lane on Cherwell Drive appears to derive from the decision to operate the signalised Marsh Lane junction so as to give priority to traffic approaching southbound on Marsh Lane, thereby assisting the proposed BRT service for the Eastern Arc. (Excess traffic would queue on Cherwell Drive instead, thus delaying local bus services). However vol. 2 of LTP4 shows an alternative route for the BRT via Summertown and Marston Ferry Road (as per the existing 700 service). If this were adopted instead the green time at the Marsh Lane junction could be balanced and the need for a bus lane on Cherwell Drive possibly avoided. If congestion on the Cherwell Drive approach was likely to remain a problem the alternative priority measure of a bus gate at the eastern end of Marston Ferry Road could be considered. Presumably the replacement of the mini roundabouts with traffic lights has been adopted on the basis of modelling of traffic flows and is justified by projected improvements thereof, but it is unfortunate that no information on this has been provided, since the proposed works necessitate the removal of a large number of trees which will have a significant adverse effect on the local environment. Possibilities for replacement of these should be explored. In principle, the much better and safer provision for cycling is to be welcomed. The provision, generally, of a continuous mandatory cycle lane in both directions and across side road junctions is welcomed. However, the unexplained anomaly of not doing so at the junction of Eden Drive should be rectified. The provision of a continuous mandatory cycle lane in both directions and across side road junctions is welcomed, however, the extent to which the verges will be compromised and trees replaced should be quantified, in order that the justification for the environmental damage is proven. Although the discontinuity of the cycle lanes across Woodlands Road (in both directions) is explained by the location of the existing pedestrian crossing of Headley Way, this confuses the priority and position of ‘Give Way’ lines across the Woodlands Road bellmouths. A solution to avoid this confusion should be explored. There appears to be no intention to rectify the anomalies in the off-road cycle lane provision on London Road, east of the Headley Way junction, e.g. to prioritise cycle traffic at crossovers; this is regrettable. Consideration should be given to provision of an additional pedestrian and cycle crossing of London Road, in the vicinity of Lime Walk, to improve connections across this road, emphasise the residential character of the neighbourhood, and, specifically, to facilitate use of the Lime Walk – Osler Road route to, from and between the hospital sites, by pedestrians and cyclists. The provision of diagonal light-controlled pedestrian routes across the junction is novel; the practicality of this remains to be seen, and the setting of light sequences and durations will presumably be critical. It is unclear why advanced stop lines for cyclists, with the necessary lead-in lanes, have been omitted from two of the four legs of the Windmill Road/London Road junction; this seems illogical and should be explained or rectified. Whilst the removal of parking bays along Windmill Road would cause inconvenience to affected residents, visitors and to the commercial retail operators, it is essential if traffic, and particularly buses and cycles is to be free-running, however, the benefits of this are not discussed or quantified, e.g. by provision of data on current journey times and projections for improvement. The continuous advisory cycle lanes on Windmill Road are an improvement on the existing situation, but their benefit will be dependent upon the control of parking (legal and illegal) along this route. No benefit will be derived if casual parking is condoned so that the cycle lane is obstructed and cyclists subjected to as great or even greater danger than at present. It is disappointing that no proposals are forthcoming for the improvement of bus traffic flow on Osler Road, since congestion on this route seriously compromises the viability of services connecting to, and between the hospital sites. Although the discontinuity of the cycle lane across Margaret Road is explained by the location of the bus stops on Windmill Road, this confuses the priority and position of ‘Give Way’ lines across the Margaret Road bellmouth. The situation appears to have been successfully avoided at the Rock Edge junction, and a better solution e.g. minor re-positioning of the bus stops should be explored. 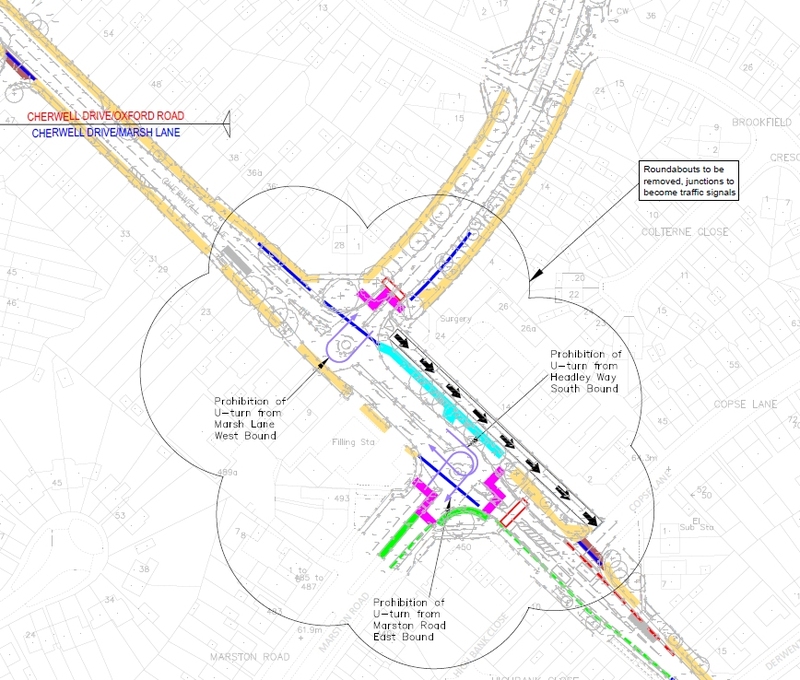 It is not clear how the proposals shown would increase the capacity of this junction, as stated, to accommodate additional traffic diverted from Churchill Drive. Clarification is needed on the intentions regarding advanced stop lines provision on Gypsy Lane and Warneford Lane. The absence of any priority provision for buses at this junction calls into question the benefit of making Churchill Drive ‘bus-only’, especially as buses attempting to exit Churchill Drive will have to contend with the additional non-bus traffic diverted off Churchill Drive onto Old Road via the Roosevelt Drive junction further west; consideration should perhaps be given to the introduction of automatic traffic control (‘bus gate’) at this point. As an alternative to the extensive works, including removal of vegetation, necessary to accommodate on-road cycle lanes along Old Road, and only advisory lanes at that, consideration should be given to establishment of an alternative cycle route via Girdlestone Road, Coolidge Close, and Roosevelt Drive, or a partly off-road route using access roads within the University’s Old Road Campus and Demesne Furze. We are very supportive of the objectives of making public transport and cycling much more attractive, in the interests of reducing congestion and environmental pollution and improving public health. In principle we acknowledge that the proposals exhibited appear likely to be effective in promoting these objectives, however there is an over-arching shortcoming in that no evidence is offered in the form of data or predicted consequences, to demonstrate the effectiveness, or justify incurring the adverse effects which would inevitably result. We have also identified a number of specific issues which we consider merit further consideration, both to rectify anomalies and to ensure that the optimum solutions are implemented. Our support overall for the proposals is thus subject to significant qualifications.